CLEVELAND, June 13, 2017 /PRNewswire/ -- A University Hospitals Seidman Cancer Center (UH) study shows TempTraq®, a patented, wearable, Bluetooth® continuous temperature monitor in the form of a soft, comfortable patch, can detect a rise in body temperature up to 180 minutes earlier, in a majority of patient cases, than the current standard-of-care (SOC) method. Earlier fever detection empowers clinicians to intervene faster. The promising results were published in the Journal of Clinical Oncology in conjunction with the ASCO Annual Meeting, which took place last week in Chicago. "This temperature monitoring patch has the potential to improve clinical outcomes for patients undergoing stem cell transplant and intensive chemotherapy for hematological malignancies by identifying neutropenic fever and beginning clinical interventions sooner," said Dr. Ehsan Malek, MD, UH Seidman Cancer Center. "We are looking forward to the next step in our researchimplementing this temperature patch in the outpatient stem cell transplant setting." "It has been very exciting for our project team, the bedside nursing staff, and our patients to see this device working in real time," said Nina Dambrosio, MSN CNP, UH Seidman Cancer Center. 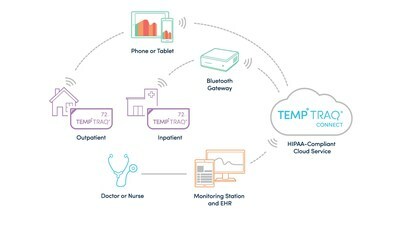 Though it wasn't tested in this study, Blue Spark's TempTraq Connect, a secure, HIPAA-compliant service supported by the Google Healthcare Cloud Platform, will allow the patches to integrate directly with hospital central monitoring systems and electronic health records (EHR) to safely and securely store patient health care data. Nurses can then view the temperature in their system as frequently as needed and can receive real-time audible or visual temperature change alerts at patient bedsides and/or through the central nursing station. Plus, no more waking patients to take their temperatures, and the hygienic, single-use, disposable design eliminates the hassle, time and cost of sterilizing the device between uses. Founded in 1866, University Hospitals serves the needs of patients through an integrated network of 18 hospitals, more than 40 outpatient health centers and 200 physician offices in 15 counties throughout northern Ohio. The system's flagship academic medical center, University Hospitals Cleveland Medical Center, located on a 35-acre campus in Cleveland's University Circle, is affiliated with Case Western Reserve University School of Medicine. The main campus also includes University Hospitals Rainbow Babies & Children's Hospital, ranked among the top children's hospitals in the nation; University Hospitals MacDonald Women's Hospital, Ohio's only hospital for women; and University Hospitals Seidman Cancer Center, part of the NCI-designated Case Comprehensive Cancer Center. UH is home to some of the most prestigious clinical and research programs in the nation, including cancer, pediatrics, women's health, orthopedics, radiology, neuroscience, cardiology and cardiovascular surgery, digestive health, transplantation and urology. UH Cleveland Medical Center is perennially among the highest performers in national ranking surveys, including "America's Best Hospitals" from U.S. News & World Report. UH is also home to Harrington Discovery Institute at University Hospitals part of The Harrington Project for Discovery & Development. UH is the second largest employer in northern Ohio with 26,000 employees. For more information, go to UHhospitals.org.